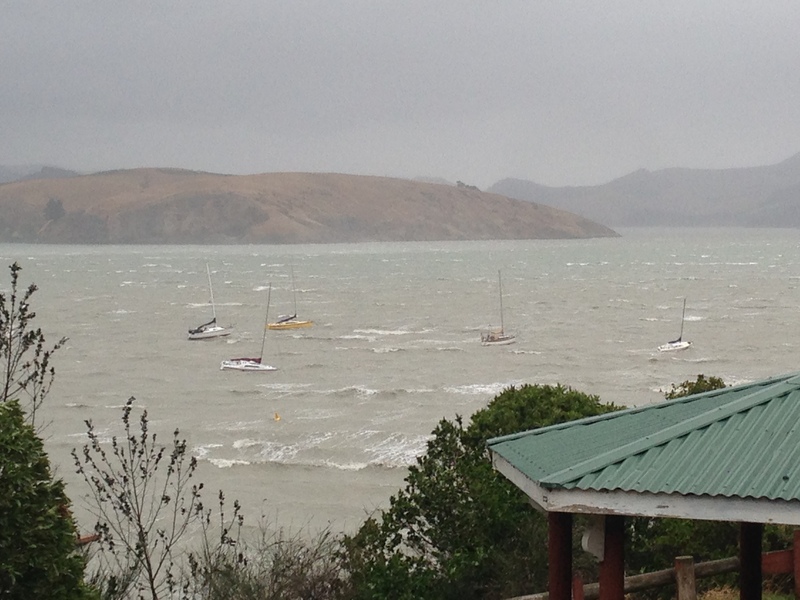 Living in the South Island of New Zealand means that we get our fair share of dirty weather tracking up the country so I have got a healthy respect for Mother Nature and her power having been caught out in a storm or two while out sailing. And many more occasions I have spent sitting on the shoreline watching poor Wildwood getting a hiding on her mooring from the vicious Southerly wind and waves. We always make a point of checking the forecast before we head out sailing, but inevitably, one day you are going to get caught out, and so it is important to come up with a strategy to deal with the conditions as they arise. One of the main issues is the possibility of being caught in a storm is being unable to make any headway and getting blown on to a lee shore. A boat is far more likely to be able to survive the onslaught of wind and waves at sea, but the land will smash a boat in minutes – so care should always be taken to leave some sea room – or ‘maintaining a weather gauge’. If you are going to try and seek shelter, then consider that if it is easy to get there by running downwind, then you are likely to have the lee shore issue. On the flip side – a nice sheltered spot is likely to be to windward and difficult to get to. Take in to consideration the likely conditions at the harbour entrance, tide issues, and anchoring/mooring facilities before attempting to enter during a storm. Waves are more of a problem than wind. Any breaking sea higher than half the length of the boat can place you seriously at risk. Take in to account the true and apparent wind speeds. When the wind is behind you things can seem quite calm, until you turn upwind again and find the wind is much stronger than it previously seemed. The forces on the boat are also much diminished going down wind as opposed to slogging upwind. The apparent wind is lessened and the boat can take the seas more easily. Also be aware than if you turn in to the wind to take down sails, on larger boats they can flog violently and cause damage to both the boat and anyone caught in the way! A way to assist with this while going downwind is to ease the main sail out far enough to provide some shelter on the foredeck. With these things in mind, generally running off – or going downwind is usually a better option if sea room allows. 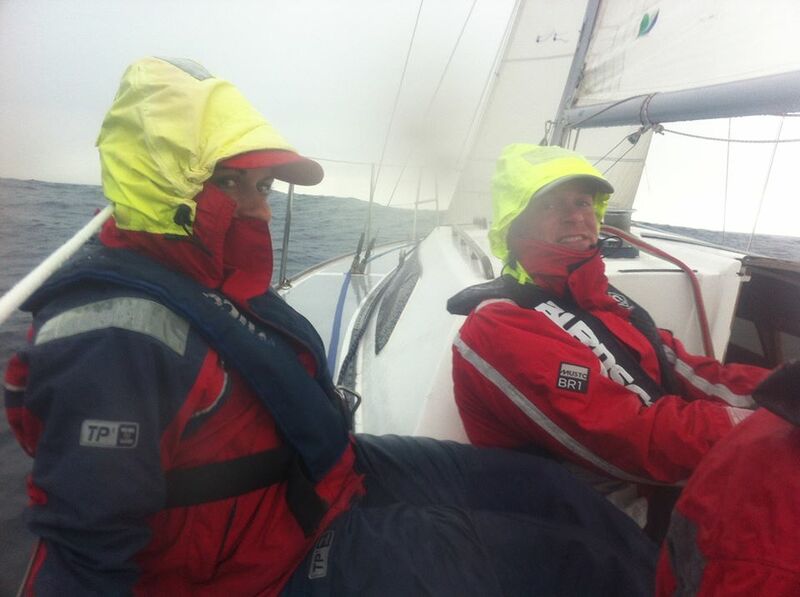 Depending on the wind speed and sea conditions, you have a number of options. Initially you should of course reduce sail, reef the main, and furl in the headsail, or if necessary deploy storm sails. Yachts should have a decent set of storm sails – a storm jib which can be easily deployed. If you have a furling headsail, consider what options there are for another forestay (and possibly running backstays to support it). In place of a mainsail you should have a fourth reef point or a trysail – which has a few benefits. Ideally the trysail should have its own track on the mast, meaning it can be set without having to remove the mainsail. (or alternatively there is a gate in the main track above the stowed main) They do not use the boom – therefore if that is damaged then a trysail can still be used. The tack is usually set higher than the gooseneck, meaning the sail sits up higher away from breaking seas. They are also usually brightly coloured to attract attention. The disadvantage of a trysail is that they don’t go so well dead downwind and tend to gybe themselves – which isn’t too bad without a boom attached, but it is something you want to avoid none the less. Other tactics include heaving to – you can read my blog post on how to do that here. You can also deploy a sea anchor or a drogue – and again I have written in more detail about the options here. Skip Novak has got a great series of videos about storm tactics. 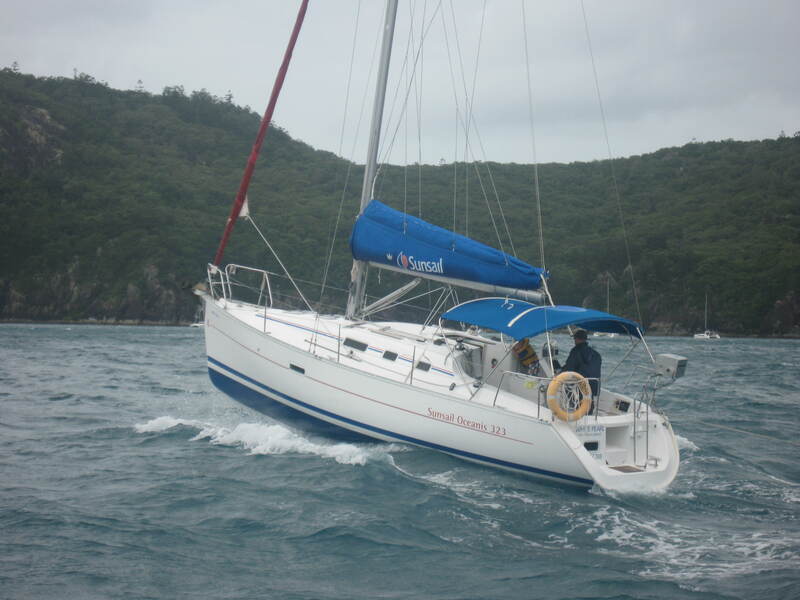 He likes a fourth reef as opposed to a trysail, and he also prefers heaving to as opposed to trailing lines. Check out the series of his storm videos here. Another option suggested in the boat is to motorsail to windward. 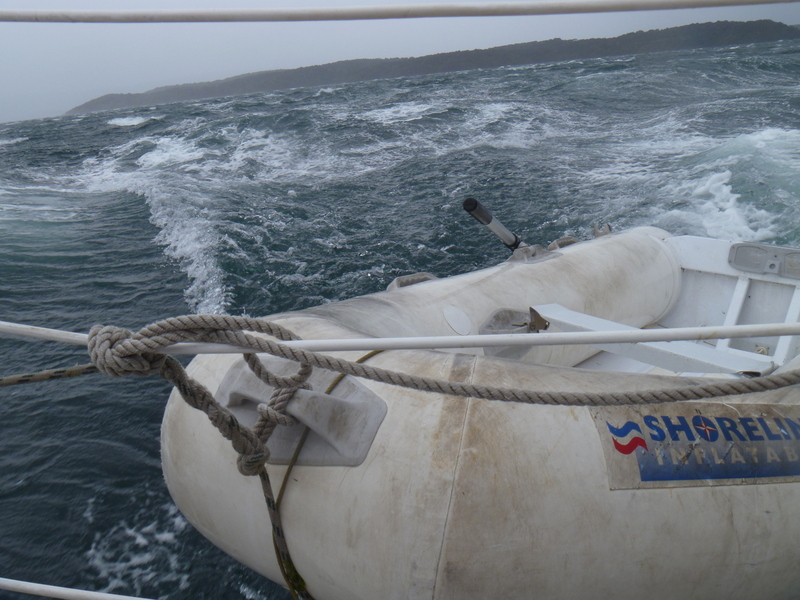 I was in a big storm in Stewart Island where we tried this and failed as the motor got a big gulp of air when we were heeled right over and it stopped – meaning we had to bleed it before we could get the motor to go again – this made anchoring a bit difficult! So I wouldn’t want to try that again unless we had no other alternative. There are a few tactics for when steering in large waves. When sailing upwind, you should try to avoid ploughing straight over the top of the wave and falling in to the trough on the other side – pounding your boat like this can cause major damage. By attempting to bear away as you go over the top, and then steer back up again as you climb up the back of the next wave. In other words – don’t point too high. When going down wind, you want to control the speed of the boat to stop yourself surfing down the front of the wave and broaching. Broaching happens going down wind. With the wind behind, there is little steadying influence from the wind on the sails and the boat can start to roll. As this happens the rig goes one way and the rudder swings out the other and these centrifugal forces combined she will try to round up in to the wind. If the sails aren’t eased to compensate, the rudder doesn’t work and the boat will lay over on its side until the wind has spilled from its sails and she comes back up again. You are far less likely to broach in strong winds if you can steer straight – avoid the rolling starting in the first place, and keep your speed down – shorten sail, deploy a warp or a drogue. The last thing you want to do is to surf down a wave, nose dive in to the wave in front and potentially pitch pole the boat. Knockdowns can occur when you are caught beam on to a sea and this has potential to cause a capsize. Storm tactics aim to avoid getting caught in this situation. You can also download this E book called Surviving the Storm by Steve & Linda Dashew. Just note that it is over 600 pages long before you click the print button!